GURGAON, March 20, 2017: SpiceJet, the country’s favourite low-cost carrier, yet again embarked on its journey of #GivingWingsToDreams by offering the special treat to around 50 underprivileged children in association with the Rotary Club of Chandigarh. The airline operated a special flight on 20 March, 2017 from Chandigarh for a set of kids who have never flown before thereby giving them a lifetime opportunity. The special initiative programmed a one hour flight for kids aged between 12 – 14 years who were very excited to fly for the very first time. The children were completely attended to and taken care of by the airline crew who engaged with them providing them with more information on the voyage experience and the place, thereby making the tour even more eventful. The children were provided healthy snacks like sandwiches and juices while on-board. The children invited for the initiative belonged to states like Punjab, Haryana, Himachal Pradesh, Uttrakhand, Uttar Pradesh and the union territory of Chandigarh. #GivingWingstoDreams is a special initiative by SpiceJet under which the airline organizes these special treats for underprivileged children and for children with special needs, with such regular activities throughout the year. 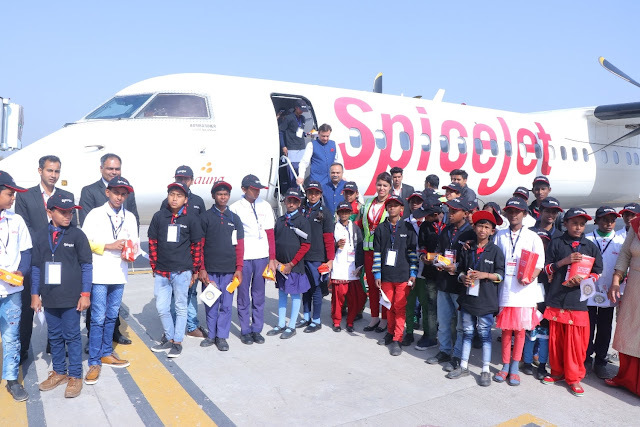 This year and last year too, SpiceJet has conducted similar flights for underprivileged children from Delhi to Goa on the occasion of Holi. Past initiatives also included similar flights for children from Calcutta orphanages for a day trip to Delhi and for a group of autistic children from Chennai, who were taken for a day-trip to Madurai. SpiceJet is India’s favourite airline that has made flying more affordable for more Indians than ever before. SpiceJet operates 343 average daily flights to 45 destinations, including 39 domestic and 6 international ones. The airline connects its network with a fleet of 32 Boeing 737NG and 17 Bombardier Q-400s. The majority of the airline’s fleet offers SpiceMax, the most spacious economy class seating in India, as an additional fee option. SpiceJet was conferred the CAPA Chairman’s Order of Merit for fastest turnaround in FY 2016 (Feb., 2017) 'Asia's Greatest Brands - 2016', ‘Global Asian of the Year Award’ for Mr Singh, & 'Asia's Greatest CFO 2016' at the AsiaOne Awards at Singapore ( Jan., 2017). These added to the tally of global recognitions received throughout 2016. Some of the key accolades that were conferred in 2016 are ‘World Travel Leaders Award’ received by Mr Ajay Singh at WTM London (Nov 2016), ‘Best Check- in Initiative’ award by Future Travel Experience global awards in Las Vegas (Sep 2016), Smart Check In Initiatives awarded at CIO 100 India Symposium & Awards in Pune (Sep 2016), ‘Best Employee Engagement’ amongst 104 corporate entries at the 4th DMA - Thomas Assesments National Award for Excellence in Talent Management in New Delhi (Aug 2016), Best Transportation brand as well as the Best Airline Brand in India for 2016 by Brand Trust Report (Apr 2016) and the four Best Domestic Airline Awards, one for each of the four regions of India by DDP TravTalk.